Last year’s maiden voyage of HARD’s Holy Ship! was a floating rave for the history books. So it’s only right that FG returned for the sequel (note the two exclamation points) and take Holy Ship!! over pirate-style once again. A-Trak, Oliver, Tommy Trash, Crookers, Dillon Francis, Baauer, RL Grime, Brodinski and even more of your favorite DJs got in on the action, check Josh Wehle’s recap video to see just how wavy it got. And for more aquatic action, peep Rukes’ photo galleries from days one, two and three. Evil Nine feat Danny Brown "The Black Brad Pitt"
Danny’s collab with Evil Nine (released on our bud Brodinski’s Bromance label) now has an appropriately odd video, premiered by Pitchfork. Hit the jungle and bug out. We’re proud to finally spill the beans on THE GOLDMINE, our new premium digital subscription service, powered by drip.fm. 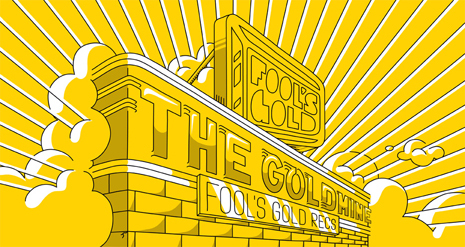 For a low monthly subscription fee, fans get exclusive access to all new Fool’s Gold music as high quality 320 mp3 / WAV downloads, plus tons of extras, including hand-picked selections from the label’s back catalog, exclusive content (remixes, accapellas, DJ sets), merch discounts, priority access to events, and whatever other surprises we decide to cook up. This January the crew set sail aboard the maiden voyage of Holy Ship! and brought a dose of FG swag to the high seas rave. Check out our own recap of what went down – from the Fool’s Gold Rap Party to Danny Brown’s solo set to A-Trak’s DJ lessons and main-stage antics (including a DJ hero conga line!) – and peep the official Holy Ship! video of the whole thing after the jump. There’s also a ton of great photos from our homies KirillWasHere (one and two), Rony’s Photobooth (one, two, three, and four), Rukes (one, two and three), Glenjamn (one, two, three and four) Rolling Stone, Spin, and Holy Ship!’s own Facebook gallery. Karmaloop TV just posted up Derick G’s footage from our Rap Party in Miami at The Standard pool. 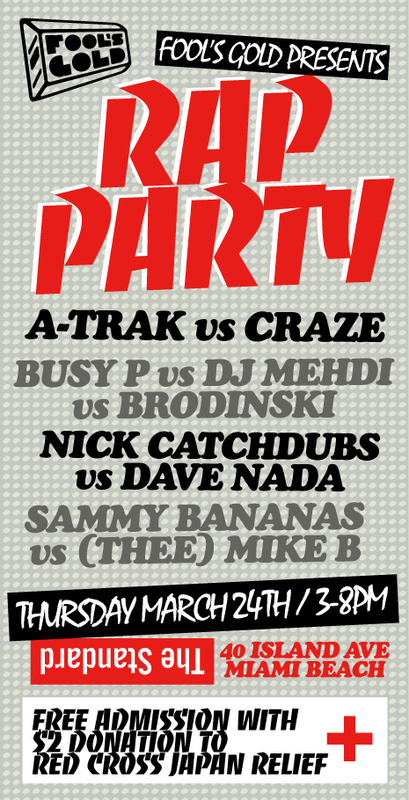 This was a special daytime party we threw two days before our Grand Central blowout, and MAN!!! Before the big FG Miami extravaganza this weekend, we figured why not warm things up with our friends? RAP PARTY is just what you’d expect from the name: an afternoon of rap jams spun b2b from A-Trak and Craze, Busy P, Mehdi and Brodinski, Nick Catchdubs and Dave Nada, and Sammy Bananas and (Thee) Mike B. It goes down from 3-8pm at The Standard and is free with a donation to the Red Cross’ Japan relief efforts. We’ll see you there!